Strikes targeted Iranian weapons storage, intelligence & logistics sites, training camp; Syrian army air defense missiles fired at Israeli jets; 12 Iranians killed; Netanyahu: We have a permanent policy: To strike at the Iranian entrenchment in Syria and hurt whoever tries to hurt us. The Israel Defense Forces (IDF) carried out airstrikes in Syria overnight Sunday into Monday in response to a rocket fired by Iran’s Quds Forces operating from Syria. A rocket was fired and intercepted by an Iron Dome defense system in the Golan Heights over Mt. Hermon on Sunday afternoon, the IDF closing the vicinity and ski resort given the security risks. The IDF confirmed it began strikes on Sunday night targeting several Iranian targets in Syria and warned the Syrian army to not use its air defense systems. 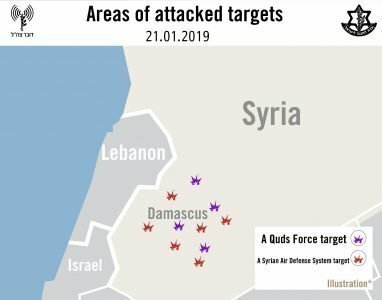 The IDF confirmed its strikes hit Iranian munition storage sites, a military site close to the Damascus International Airport, several Iranian intelligence and logistic sites and a military training camp. The IDF, consistent with any reports confirming operations in Syria, published footage of the Iranian targets hit in the strikes. Russia’s Defense Ministry reported that Syria’s air defense systems destroyed over 30 Israeli missiles from attacks on “the west, south-west and south” of Syria. It initially reported that 4 Syrian “servicemen” were killed in the strikes overnight, with 6 others injured. The Syrian Observatory for Human Rights reported that 12 Iranians were killed in the operation, as well as 6 Assad regime forces. Be sure to watch Amir’s Middle East Update on these strikes and much more!